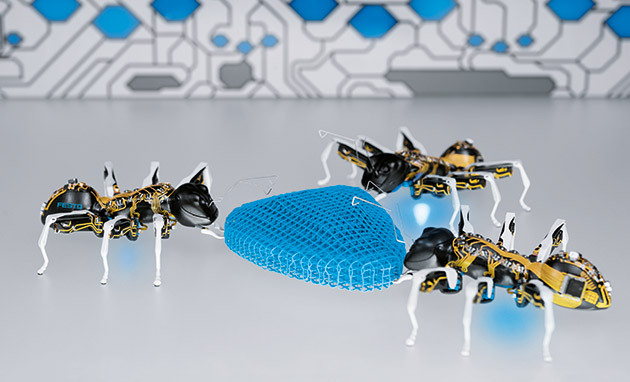 Festo’s insect-inspired robots act like the real things. This entry was posted in animal, boïd, robot, swarm on 04/01/2015 by Ogen. Wei-Min Shen of the University of Southern California’s Information Sciences Institute recently reported to NASA significant progress in developing ‘SuperBot,’ identical modular units that plug into each other to create robots that can stand, crawl, wiggle and even roll. He illustrated his comments with striking video of the system in action, video now posted on line. This entry was posted in animal, boïd, bot, robot, swarm on 02/23/2007 by Ogen.